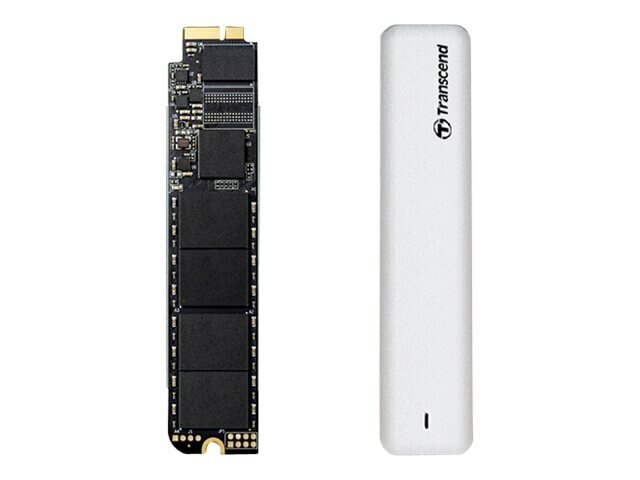 Complete with tools, instructions and a slick aluminum USB 3.0 enclosure to house the drive, Transcend's 480GB JetDrive 500 SATA 6Gb/s Internal Solid State Drive Upgrade Kit allows you to both increase your storage space and boost the performance of your Mac. Upgrading your Mac to a JetDrive ensures you'll have plenty of space for all your favorite music, videos, and photos. With file transfer performance that far exceeds stock solid state drives, JetDrive provides both speed and stability. Whether you're browsing the internet, gaming, or running multiple applications simultaneously, JetDrive delivers the performance you need. The JetDrive 500 comes with an additional external enclosure. This sturdy aluminum case is ready to house your original soloid state drive for use as a new external drive. Thanks to its speedy SuperSpeed USB 3.0 interface, waiting for transfers to complete becomes a thing of the past. Its clean, simple lines and solid aluminum construction make the included enclosure a perfect companion to your Mac. Transporting your data becomes a breeze and with JetDrive Toolbox sofware, monitoring drive health is even easier.